YOU CAN TURN YOUR WORLD UPSIDE DOWN WITH PRAYER! The New Testament apostles did. They prayed with passion and power — and turned their world upside down. We are not all called to be apostles, but we are called to be apostolic people and help establish the work of God in others by our prayers. Ground-breaking evangelistic prayers that empower the work of the Gospel and prepare hearts to receive it. Pastoral prayers that build up churches and establish Christians in the faith. Prayers of thanksgiving that return praise to the "Lord of the Harvest" for what He is doing in His people. A devotional aid, but also a tool for intercessory teams. Examining the prayers of the first Christians is a great start in helping us recover the meaning and reality of authentic prayer. Jeff Doles has written a useful book which collects and organizes all of the prayers found in the New Testament. Praying with Fire is a great resource for one's own study of how the early Christians prayed. Of all the Christian books out there on prayer, Praying With Fire is the most deeply rooted in Scripture I have found, and thus more helpful than anything I have read. I look forward to putting the book into practice and recommending it to my staff and friends. 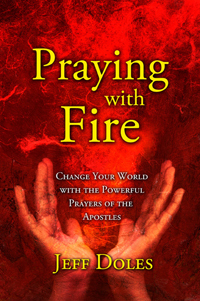 Praying With Fire looks at prayer from a refreshingly new perspective. With typical Jeff Doles clarity and simplicity, it both encourages and challenges its readers to discover the awesome power of praying the way God taught us to pray through the many examples in Scripture. This is a great book to keep handy as a reference and a wonderful aid to praying powerful, effective prayers that are always in the perfect will of God. Jeff Doles has hit another home run with his book Praying With Fire. Jeff has an extreme passion for prayer, worship and healing. This book has become a very practical tool in my life as an intercessor. I use the different chapters to target Scriptural prayers from the heart of God for my family, church, and me. His explanations of the Scriptural passages cause them to come to life. I highly recommend this book as a weapon to open the windows of Heaven to bring the will of God to earth as it is in Heaven. For those who desire to live and walk a victorious life by the authority that Jesus has given us, this book is for you. The Lord is on our side and is available to assist us to develop our potential and destiny for which we were created; but it can only be done through an intimate relationship with Him, and that means a disciplined, active prayer life. Need help in getting started? Praying With Fire, by Jeff Doles, will guide you into a deeper, passionate relationship with God that will result in aggressive “Kingdom Building”— a must for those who want to be about their Father’s business.